Every dog owner wants their pet to have a comfortable space in the house that they can call their own. A space where they can sleep and rest away from the hustle and bustle of family life and from prying fingers where there are children in the household. A dog’s bed is a great idea and a washable dog bed is even better, but with so many to choose from where do you start? Our panel of pet experts and dog lovers have created this list of the best washable dog beds to get you started. If you are looking for the height of luxury for your canine companion, as well as convenience for you, then the Orthopedic Dog Coach Sofa Bed by Furhaven is the dog bed you need. The base of the bed is made from an egg crate design foam core that supports your pet’s joints while they sleep and soothes pressure points. The peak and valley design of the foam provides the height of comfort and helps to improve your dog’s circulation. The bed is surrounded on three sides by supportive bolsters that are filled with high-loft polyester fiber. The fibers are created from recycled water bottles and provide support and additional comfort for your dog. 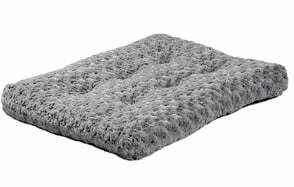 The cover is fully machine washable and the sleeping surface is created from faux fur to ensure a cozy and comfortable rest. If you are looking for a lightweight portable bed that can be used in a dog crate, then the Soft Memory Foam Bed by Brindle is ideal. The bed is filled with a 3-inch layer of orthopedic shredded memory foam fill. This ensures comfort, increases breathability and helps to eliminate pressure points. The foam is held in place by inner baffles stitched into the bed. This stops the foam from clumping or moving while your dog sleeps. The cover is made from soft microsuede that can be machine washed, and tumble dried on a low heat. This pet bed differs from previous beds on the list in that the whole bed is washable. There is no need to fight to remove and refit covers with the MidWest Homes for Pets Deluxe Pet Bed, just place the whole bed in the washing machine. 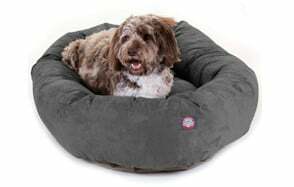 The bed’s filling is ultra-soft polyester, which does not pill up like more traditional fleece filled beds, meaning a more comfortable sleep for your furry friend. The bed has a non-skid bottom to ensure that it stays where you put it and to reduce accidents from it skidding as your dog moves onto it. 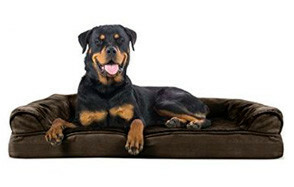 The sleep surface is tufted and extra soft, giving your dog the height of comfort. Made from premium grade materials the Suede Dog Bed by Majestic Pet Products provides your four-legged friend with the height of luxury and comfort. The surrounding bolster cushions help your dog find a comfortable position to sleep in while supporting their head, neck, and spine. The removable slipcover is made from durable microsuede, while the base is a heavy-duty waterproof 300/600 denier. The interior of the bed is made from high loft polyester fiberfill, which in turn comes from recycled materials. The slipcover is removable on the larger sizes for washing, but the whole bed is machine washable and dryer safe on a low setting. Designed for medium to large breed dogs the Orthopedic Memory Foam Dog Bed by Dogbed4less is ideal for older dogs and others experiencing joint problems. The bed is made from a memory foam insert with no cushions or sides, meaning entry to and exit from the bed is easy. The waterproof insert protects the memory foam from spills and accidents while the durable denim cover provides a comfortable and easy to clean surface. The base of the cover is non-slip to ensure that the bed stays still while you dog gets on or off it. The base of the BarksBar Gray Orthopedic Bed is created from high-quality orthopedic foam that is 4-inchs thick. The grooved foam supports your dog’s joints while they sleep and improves airflow to give the best possible level of comfort. The foam does not lose shape over time and offers great support to older dogs. The ultra-soft cover has a rubber non-slip back for safety and is removable for washing. Added comfort is gained from the cotton rim cushion, which provides support for your dog’s head, neck, and back. The OrthoComfort Deep Dish Cuddler provides a warm and cozy space for your dog to sleep. The high cushioned walls provide an additional sense of protection, while offering space for sprawling. The front cushion is lower for easy access and acts as a head rest to support the neck during sleep. Made from quality materials including non-toxic virgin AirLOFT fibers it maintains its shape better than many other beds with similar stuffing. The tough and durable base is made from water and dirt resistant nylon that reduces the risk of mildew buildup. The whole bed is machine washable and dyer safe for convenience. The rectangular shaped Blueberry Pet Heavy Duty Pet Bed mimics the shape and comfort of your sofa, giving your dog the same level of comfort, but in their own private space. The cover is made from thick microsuede fabric, which is durable and scratch resistant. The filling is 100% micro fiber, which is eco-friendly and made from recycled material. The cover is fully removable and machine washable on a cold cycle, better still it is also dryer safe. The lowered front cushion allows for easy access to the bed while doubling as a convenient head or paw rest. There are many factors to consider when buying the perfect washable dog bed for your four-legged friend. Your dog’s size and weight play a part in the decision, as does their preferred sleeping position and the amount of space you have for the bed. In this part of the guide we explore other factors that determine the right bed for your dog and look at why you should consider a washable bed over other types of dog beds. Why Use a Washable Dog Bed? A dog’s bed gets dirty, smelly, and full of loose hair over time. Combined with moisture from where your dog cleans themselves and sweat, this concoction can develop into bacterial growth over time, as well as damp and mildew. Not only does this make for an unpleasant smell and discourage your dog from sleeping in the bed, but it could make the whole house unpleasant and even make your dog ill over time. Washable beds reduce all these risks, making it easier to keep your house and pet smelling fresh and clean. Washable beds also reduce the risk of allergies from dust mites and help to keep flea infestations under control, particularly if you choose a bed that can be washed in its entirety and at higher temperatures. When you look at a washable bed, check whether it is machine washable and at what temperature. Some beds can only be washed at low temperatures, so may not be suitable for dogs with a tendency to roll in the mud. Also, check whether it is the cover or the whole bed that can be washed. If you have an older dog that is experiencing bladder issues or a puppy still house training a fully washable bed may be an advantage. You want your dog to be able to have their bed back as soon as possible, so a bed that can go in the dryer is a distinct advantage. Always check the temperature settings before placing the bed in the dryer. There are a wide range of fillings available including orthopedic memory foam bases. The type of filling you choose may be dependent on the age of your dog, but you should always check that it is safety tested, allergen free, and durable. You don’t want a bed where the base moves and clumps as your dog is trying to get comfortable. This is especially important if you are placing the bed on a tiled or wood floor. The last thing you want is for the bed to move as your dog tries to get in or out of it. They could suffer an injury or simply refuse to use it if they do not feel safe. If the base is waterproof this is an additional bonus as it reduces the risk of the bed becoming damp from spills. As well as being comfortable, you need to ensure that the cover of the bed is durable and can withstand daily use by your dog, as well as regular cleaning. Check for strong stitching and seams, and ensure that the zip, if included, is not on the sleeping area. While the key to a clean dog bed is to have a washable dog bed, there are other steps you can take to help keep your dog’s bed clean. Keep your dog clean and groomed. This is good for your dog’s coat as well as their bed. As well as regular grooming, check their paws after you have been out for a walk. Ensure you dry your dog thoroughly before they go back to their bed to prevent illness and reduce the risk of mold and mildew from forming. Vacuum the bed. This reduces the buildup of hair from your dog and tackles dried mud and dirt before it grounds in. If you can’t vacuum the bed easily, take it outside and give it a good shake on a regular basis. Clean spills and spot clean. If you notice a spill or dirt on the bed, then clean this as possible. Doing this makes it much easier to keep smells and bacteria under control. Wash the bed on a regular basis. If you have a bed with a removable cover, we recommend that you wash them every one to two weeks. If the whole bed can be washed, then once a month is the general recommendation. It is essential that you dry your dog’s bed thoroughly before they use it. Damp beds are a breeding ground for bacteria, as well as being uncomfortable for your dog to sleep on. Even if you can tumble dry the bed it is a good idea to leave it in an airy space for a short while to ensure it is fully dried before returning it to your dog.